I much prefer the best of Malaysian Minds, yes individuals, be given exposure and more air time on our electronic mass media. At present, there are many of us daughters and sons of this soil, yet I seldom see the opportune for these superb Malaysians be given to voice out the sharing of vital and valuable information, providing various benefits for the entire nation. 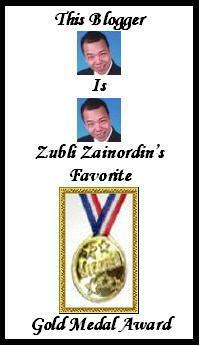 Particularly I am one of the Prime Movers in Malaysia. Well, this small opening given to me I prefer shall be big and wide soon. I am an invited guest for a radio show at IKIM on every Monday, for the whole month of December, 2007, from 5:00 PM to 6:00 PM. The first topic given to me, The Qualities of The Malays. I have always prefer to put forward my own award designed to be presented to bloggers and their blogs particularly super fine bloggers with superb blogs, deserving Gold Medal Award and Gold Trophy Award. Now I am able to present one of these three versions. 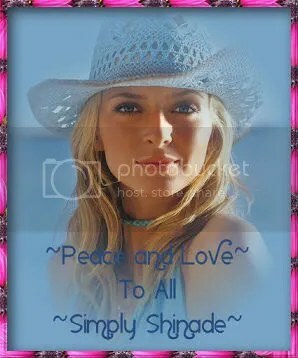 These are templates, For each recipients, I shall do each a special one for him or her. Preferably this will bring about enthusiasm, excitement, and enjoyment to bloggers within the bloggosphere. The God willing, I shall be traveling again. To Shahzan Inn Hotel, in Kuantan, Pahang. I have been here before, yet soon I will be conducting a training for the Ministry of Education Malaysia staff, about 50 of them, equal number of women and men, mostly virgins. The Training – Efficient Counter Service and Effective Telephone Techniques. My team of professionals are set to go…19th Of November, 2007 till 23rd Of November, 2007. We are traveling from Rawang to Kuantan. Whether you stay is for pleasure or business, Shahzan Inn Kuantan refreshes you like no other. wish the ambience perfected to catch the cosy mood of the retreat away from it all but never away from the finest thing in life, Shahzan Inn Kuantan is the excellence choice. It is located in the heart of Kuantan which put you right on the center of activities where you can observe Malaysia at their natural friendliness. 127 tastefully furnished rooms at Shahzan Inn, Kuantan comprise of 10 suites, 25 family and 92 deluxe rooms are made available for your preference. They come with standard features like the individually controlled air-conditioning, IDD telephone and colour televisions. I shall be pretty occupied with this joy, and I shall be into blogging whence I am free. 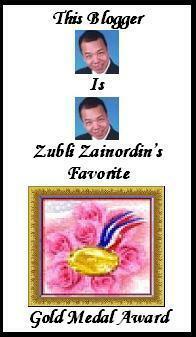 Zubli Zainordin is an acclaimed PM Of Malaysia – Prime Mover of Malaysia. He has devoted his life with total commitment especially in the field of human development toward nation-building through the “Vision 2020” and “Malaysia – Excellence Glory Distinction”. As a Prime Mover he has been traveling throughout Malaysia, Brunei Darussalam, Singapore, and Indonesia sharing the key to huwmen total success. Presently he is also traveling overseas and visiting countries of the world as a Prime Mover. His motto include: “Malaysia Tapakku, Dunia Pentasku” or “Malaysia Kampungku, Dunia Negaraku”, (Think Local, Act Global), “One World One Mission“, and “Unity in Diversity”. I am not aware of TeamBuilding until in 2002 I joined one of the best companies in Malaysia, Paximej (M) Sdn Bhd. In addition to its sister company Karisma Sdn Bhd. Slowly and yet surely, I pursue to rank amongst the best Trainer for Peak Performance TeamBuilding or IMPAK. There are a lot you can say when an award is presented to you. 01) Please say at least one nice sentence. Please say not “I do not know what to say”. 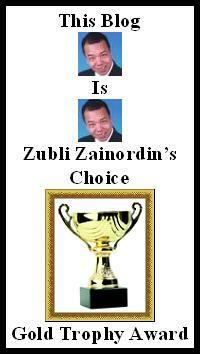 02) At the very least, can you even write or say, “Thank you for presenting this award to me”. * This award you presented to me is so nice. Since you have passed this to me, rest assured I shall pass this award to another or other blogger who is truly deserving. * combine any of the above, or state what is better. Every Day Should Be Christmas, Santa’s Wish List, and co-authors Santa’s Community Blog. I have been observing happenings within the bloggosphere. 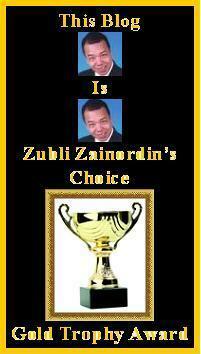 As an award presenter and recipient, I see responses and reactions. Thus I share my wisdom here. Perhaps you already know, I am one of the pioneers within the Bloggosphere to initiate individual’s award to another and other blogger. This is one of the ways I initiate to raise bloggers to experience the next level of blogging enthusiasm, excitements, enjoyments, and enlightenments. Soon, I witness other individuals who begin to present awards, receive awards, and proceed to present awards. In these proceedings, I do get an award that I am asked to proceed in presenting them to another and other bloggers. I have been receiving awards too, but I never once given the award presenter such a response. 01) If you are sincerely speechless when an award is presented to you, then, keep the speechlessnizationness to your self. The God willing, I shall share with you some examples. For a Peak Performance Team Building course, I normally prefer participants know Synchronicity, so that later they will understand the Total Movie they are in. I cannot imagine how he works. But he works day in and day out. Like 24/7. Emmm…. So I offered a bit of an assistance. I have just add her, join her e-Community, and register as a member to enable me to submit and read articles here. Santa Claus authors Santa-Mail, Santa’s Elf Club, Santa’s Wish Tree, Every Day should be Christmas, Santa’s Wish List and co-authors Santa’s Community Blog. 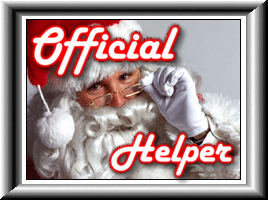 I am now Santa Claus Official Helper. The is an honor as well as a Responsibility. I shall cherish forever. To my children and successive grand children look!! A Nice Place in the Sun, A Week In The Life of A Redhead, All Free Stuff Blog, Bobbarama, Bobbarama Humor Carnival, Bobbarama StumbleUpon, Book Project, Christmas Wish List, Christy’s Coffee Break, Climate of our Future, Dog Cents, Emila’s Illustrated Blog, Everyday Should Be Christmas, Feel Happy, First Time Dad, FuelMyBlog, Hearts a Fire, Homeless Family’s Blog, Homeless In Jax, Home with Heather, Laketrees, Laketrees1, Life with Heathens, Lilyruth’s This and That Cottage, Lynda’s Loft, Mariuca, Mariuca’s Perfume Gallery, My Life is Murphy’s Law, Polliwog’s Pond, Polliwog’s StumbleUpon, Purplefrogcat, Revellian, Santa’s Community, Santa Elf’s Club, Santa Mail, Santa Wish Tree, The Blog Fairy, The Insane Writer, This is a Miracle, Writer’s Reviews, Twist and Skewer, Your Wisdom of Total Happiness, Zubli Zainordin. 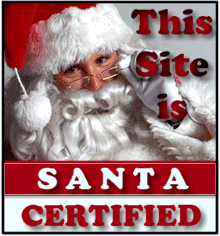 Santa Claus at MyBlogLog authors Santa-Mail, Santa’s Elf Club, Santa’s Wish Tree, Every Day should be Christmas, Santa’s Wish List as well as co-authors Santa’s Community Blog. theblogfairy (Gracie Belle), hrtsafire (Joey Cupps), polliwog (polliwog), abhatnagar19 (Aayush Bhatnagar), AdTracker (Ad Tracker), azmeen (Azmeen Afandi), BlackWyrm (Jon), bobbarama (Bobarama), bromoluz (Cristian), Cafefernando (Cenk Sonmezsoy), chepay118 (Cheryl Estorgio), CrisZimermann (Cris Zimermann), conancat (Chun Ooi Ang), cotojo (Colin Richards), crizlai (YC Lai), danielctw (Denial Chew), deltaphi (david may), edasuner (Eda Suner), ejcooksey (Elisabeth Cooksey), Fastfastlane (Deborah Petersen), forumer (Ahmad Nizam Awang), IdentikitDK (riccardo terranova), illusionaire (Sandman), incinq (Adria), JaniceNW (JaniceNW), JesseTheCat (Trixie Wolf), Kassper (Dario Kasumovic), laketrees (Kim Barker), Lobodomar (André Soares), Marzie (Mariuca), Mattsofi (Ahmad Sofi Md Hashim), mightymorgan (morgan macgregor), MiikaMiika (Miika Mika), NdpThePoetress (Jeane Michelle Culp), NIHAL (NIHAL), nuovibusiness (Francesco Sortino), oiloffmar (oiloffmar), promthep (promthep sriprayoonpaisarn), RandomMagus (Amber Azam), RBLChloe (Barrett Laurie), Revellian (Bobby Revell), rvnx11 (denny tyler), Samanathon (Saman Sadeghi), SantaBlog (Santa Claus), Seiche (Seiche), sftopics (sandra fabria), sohoquest (Michael Beck), tessasandiego (Tessa Cruz San Diego), thebaptist (Simon Rodrigues), thedude25 (bryan clark), thor78 (Ron Del Rosario), unomateo (matt dunlap), WondahWoman (Wonder Woman), Yasmin35 (Yasmin35). AAACopywriter (Alex Badalic), adnil (Lynda Winsor), ajinumis (Nessa), Alkye (Eleonora), alltheline (donno alltheline), angkara (Budiman Daud), amonhanor (amon hanor), Auntie Dar’s Life (Auntie Dar’s Life), autobot (cadillac man), awannabewriter (awanna bewriter), Awiwik (aww ciel), bblweb (Ann Liu), catpawdreamvibes97 (NAFA SG), cfaslave (Brent Evans), chuva (Chuva Chienes), citracitra (andy ), Crazyharp81602 (Sherry Konkus), Daddyp (Daddyp), dartim (darlene beaudin), davincim (davincim), digitalfilipino (Janette Toral), disassociated (John Lampard), dlwjr (Donald White Jr), eastcoastlife (eastcoast life), ebestagent (ebestagent), EddieJohn66 (Eddie John), eklesene (eklesene), emilayusof (emila yusof), EndohT (Endoh Taiki), erez (Carlos Lorenzo), esofthub (esofthub), flanture (Pred Rag), franscud (Francis Scudellari), freesecrets (Alex), gevil (Gabriel Villa), goggi1 (Remo Goggi), iblogster (Jonathan Glazier), ikechua (Isaiah Chua), jeanchia (Jean Chia), jocoiner (JCB), joezul (Joe Zul), Johnshir1 (Johnny Ong), kathleenmaher (Kathleen Maher), keretakawe (Wan Nazaruddin Wan Mahmood), kikiat (kikiat lei), kuanyin333 (kuanyin333), Laketrees, Laketrees1, lakmar (Lakshmi Mareddy), lozster (Laurie Joyce), miccom (Michael Niedermayr), michele84 (Michele), mkossatz (Max Kossatz), MommysGetaway (Tamara Pruessner), munaeem (Mohammad Jamal), nickphil67 (Nick Phillips), nishanthe (Nishanthe Hewawitharana), PamilVisions (Mihaela Lica), pdm1 (Ant B), PoeARTica, QuartzMountain (Kevin Henney), ritacosta (Rita Costa – Alma de Poesia), sbarber (Scott Barber), sdkruiser (sdkruiser), schee88 (a.k.a. schee), rileycentral (Damien Riley), sexyinred (Norlina Mohd Mushahar), shaunlow (Shaun Low), shueqry (mohd shukri bin abdullah) sidewinder (Michael de`Oz), softboxes (Janice Ng), speedcathollydale (Eric Folstad), standalone (Lhutfhy Pribadi), SugarQueensDream (SugarQueensDream), The Legend Islands, TerriTerri (Terri), thereyoucome (sh thereyoucome), thewesko (Veysel Alışık), tsupacat (Terrell Hanna), VByers (Vanessa Byers), VicGrace (Vic Grace), volkanalabaz (volkan alabaz), WanNo (Wan Norizan Abdul Hamid), WaterLearner (Karen Chiew), webaction (Web Action), weeseekim (See Kim Wee), wolkanca (VoLKaN YILMAZ), ZeNeece (ZeNeece), zodiactorzan (Mohamed Arif). 4 Dogs, 3 Pigs & A Filipino Family, 6 Ways To Make Money At Home, A Shaman Quest, AdSense Tracker, Ageless Beauty, Health and Wellness, A Week In The Life of A Redhead, Agloco, Aini, Aina & My Twin, All About Switzerland, All Free Stuff Blog, Alma De Poesia, Automotive Buzz On The Net, Blue Ribbon Bloggers, Blog Motivasi, Tips, Panduan, Cara, Asas Pembangunan Diri dan Perihal Minda, Blogging Den, Bobbarama, Bobbarama Humor Carnival, Bobbarama StumbleUpon, Book Project, Business Opportunities Weblog Brasil, Cafe Fernando Food Blog, Cafe Fernando Yemek Blogu, Car Crazy, Carnival of Goodness, Cell Tech Hub, Christmas Wish List, Credit Ability & Buying the Perfect House or Car, Criz’s Sanctuary, DaddyPaperSurfer, Damsel Quest, Damsel Quest Paradise Philippines, Diagnosis, DiSjoiNteD INtelLigenCE, Do It Youself, Do You Know Why?, E-Cashworld, E-PicWorld, E-VideoWorld, Eda Suner, Everyday Should Be Christmas, Fast Web Win College Money, Feedget, Feel Happy, Food Supplement Info, Free PC Security, FuelMyBlog, Earn Global Online, Ghost Portal Home, Golden e-Book Blog, Golden e-Books Blog For Newbies, Gurushabad, Healthy Life, Healthy Recipe, Hearts A Fire, Heavenly Inclinations, Hikmatun, Homeless Family’s Blog, Homeless In Jax, Homeschooling in the Ozarks, Horror Videos Collection, How To Make Money?? ?, Hot Buzz, Hot Biz: My 2 Centavos Worth, Hot Buzz, Hot Biz: My 2 Centavos Worth, iDaily Journal, incinq, Internet Markerting, Illusionaire, It’s A Woman’s World, JesseBlogsItAll, Keeyit, Joey My Space, Joey at Helium, Joey Stumble Upon, Keeyit’s Wonderful Life, Kelas-Blog, Laketrees, Laketrees1, Legend Islands, Life, Life in the Fast Lane, Link Building Strategies, Life With Heathens, Lynda’s Loft, Maia Jose.com, Maia Jose’s Cafe Romanza, Maia Jose’s Cafe Romanza, Make Money With FOREX Trading, Make Money Online The Quick and Easy Way!, Make Money With Kassper, Manila Mom, Manila Mom, Manila Mom’s Veranda, Mariuca, Mariuca’s Perfume Gallery, Mishmash Mirage, Money Online, MyDay07, My InBox Mail, My Pictures, MySpace Blog, Nihal’s Anything and Everything, Nuovibusiness, Paintings by a 10-Year-Old, Partner For Life, Philippine Trip: Manila, PoeARTica, Polliwog’s Pond, Polliwog’s StumbleUpon, Project Heavy Traffic, Read4Truth, Recipe Collection, Relief from Chronic Headache, Fibromyalgia and Chronic Fatigue Syndrome (CFS), Remarkable Bloggers, Resemblance, Revellian, Riley Central, Safety Tips for Newbie, Samanathon, Santa’s Community, Santa Elf’s Club, Santa Mail, Santa Wish Tree, Search Engine Optimisation and Traffic Tips, She Walks in Beauty, Software and Web Development, Sona Criedhe, Sue’s Daily Photography, Tessa – Bravenet Blog, To go to Credit Ability, add www to url, The Anitokid Chronikos, The Joke Blog, The Other Side Of It, The Painted Veil, The Pink Panther, Top Affiliate Tactics, Total Happiness, Twist & Skewer, Virtual Entrepreneur, Weddings on The Beach – Weddings In Paradise, WritePassions, Writing For…, Woman: God’s Masterpiece, Zubli Zainordin. (Badge Already Placed) Aesthetic emotions and Photography (Tiny Bellows), Auntie Dar’s Life (Dartim), Climate of Our Future (Zephyr1, FloridaWeatherInfoLady, Franscud), Comedy Plus (Comedy Plus), MishMash Mirage (LJW), Muffin53 (Empress Bee), Sarge Charlie (Sarge Charlie), This Is A Miracle (Janice Ng). to document information about me for personal reference and for my future generations to know about me, in addition for friends to know the latest update in my life. I notice others, especially visitors and readers have made this blog a hit not less than 5,000 statistics. Thus, I continuously keep this blog alive with live postings. as of 15th. 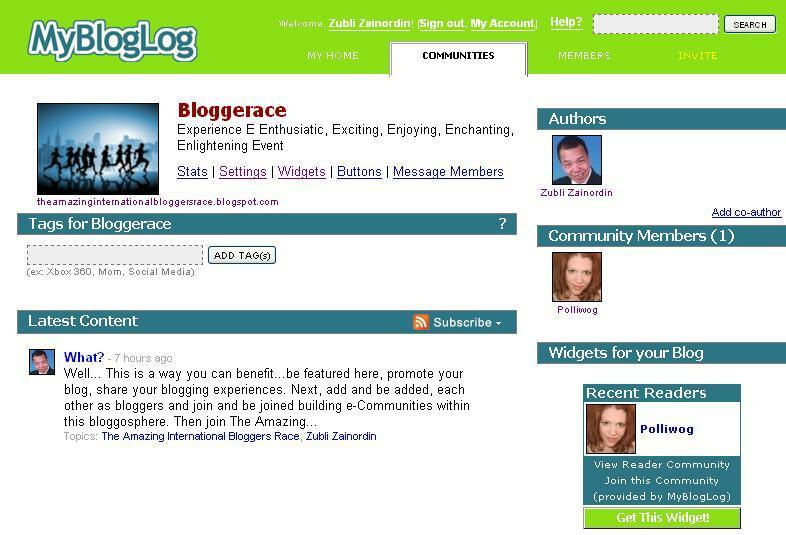 October 2007, listed 235 e-Community members.